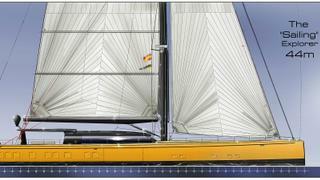 The Barracuda Yacht Design studio has revealed its latest concept, a 44 metre sloop. Designed for long periods at sea, Barracuda described the Sailing Explorer as a “fresh and robust concept” in a “stuck” sailing market. The studio also highlighted its ample storage features and longer fuel range than yachts of similar sizes. The concept features a large crew area and engine room with its own control room. Its spacious storage areas include a foredeck that can accommodate two separate tenders – one for crew and one for guests. Meanwhile two side platforms offer additional access, with one functioning as a proper diving centre. The design also caters for all weather conditions, featuring both internal and external steering positions. A self-tacking jib, furling gennaker and boom make for an easy to handle sail plan. Barracuda estimates it has limited the ship’s heel to around 10 degrees and stabilised rolling by incorporating the water ballasts into the yacht’s sheer lines. The yacht will accommodate 10 guests across a full beam master cabin aft and four additional guest staterooms that can be converted into either a double or twin layout. The crew quarters meanwhile can accommodate a maximum staff of eight. 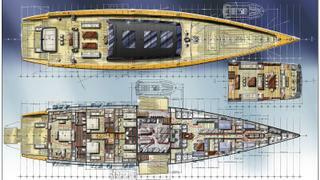 The yacht will also feature a large galley, separate laundry room and generous fridge storage space. Meanwhile the aft deck will feature a combined seating and dining area equipped with side screens for wind protection and a fixed bimini.